Bodri beach is in the first bay as you leave L’lle Rousse on the N1197 heading towards Calvi, on the North West coast. 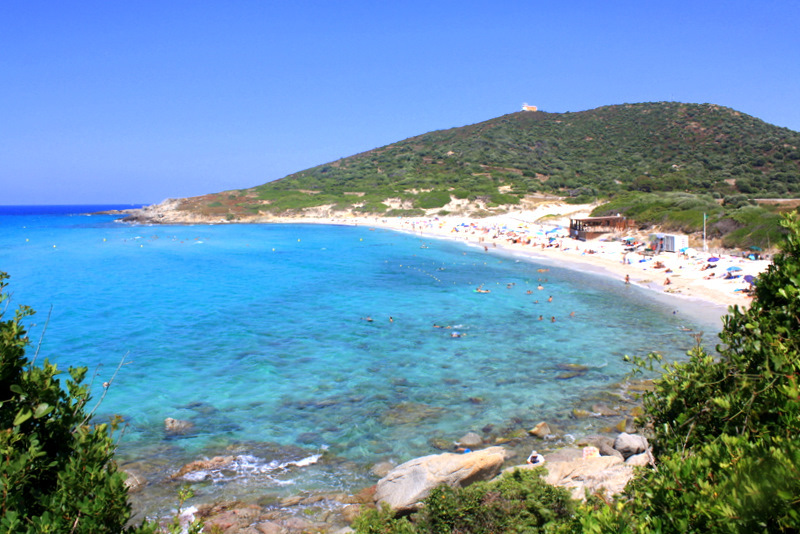 This beach is described as a beautiful, long unspoilt beach; of coarse white sand; with the water described as crystal clear and turquoise; being one of those Mediterranean havens and another jewel of the Corsican coast line. You may also read about the incredible backdrop of a high mountain chain stretching behind you covered in woodland, shrubs and small villages; how the beach is a little piece of paradise; uncrowded and the perfect blend of beauty and simplicity; and that the only building you can see is the beach restaurant and lifesaving station. These are all accurate descriptions of this beach and you are likely to find it featured on a postcard that you’ll send to impress the folks back home of your travels. The beach is backed by a scrubby headland at the L’lle Rousse end has a small rocky headland that is a great place to walk and explore. 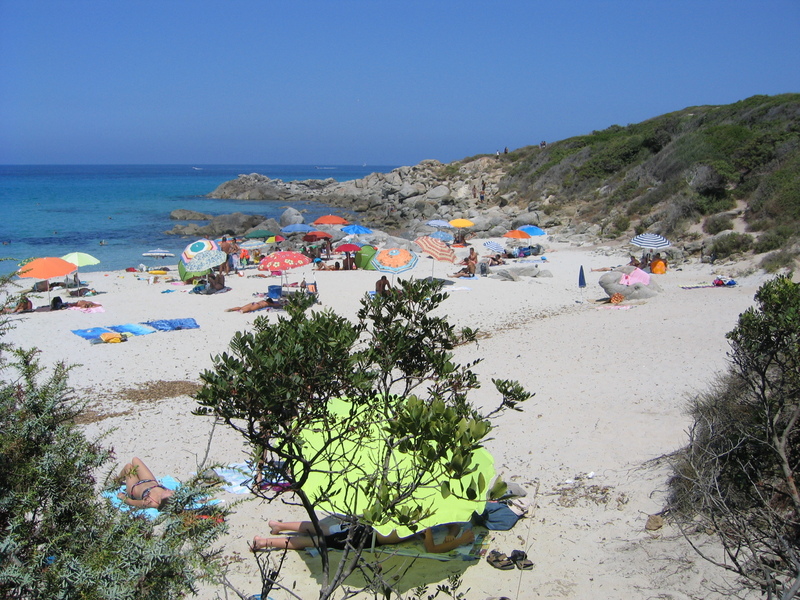 It’s also sometimes referred to as Corbara beach, which is a delightful village on the mountain chain behind. You will have a breathtaking view of the beach on the road to this village. You will also find some great accommodation in Corbara. 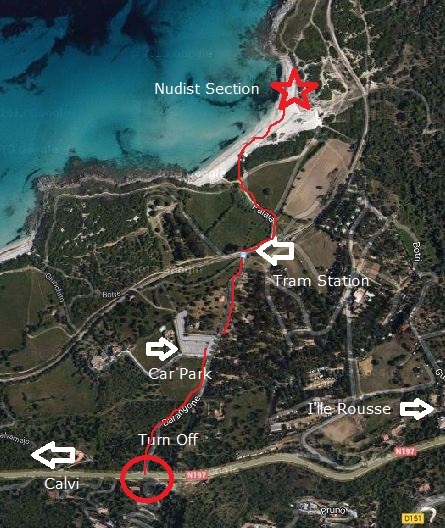 The nudist section on this beach is at the L’lle Rousse end near the scrub covered rocky headland. There is no designated nudist section as it the case on other beaches in the area. Although the nudist section is only designated by other nudists, no one bothers if you are clothed or unclothed – both groups seem to be relaxed with each other. This beach seems not all that busy and is one of those ‘out of the way’ places. So if you prefer a beautiful beach, in an idyllic setting with peace and quite this could be the beach for you.There is no shade so an umbrella is a must. There is a beach restaurant in the middle of the beach but you will need to dress. 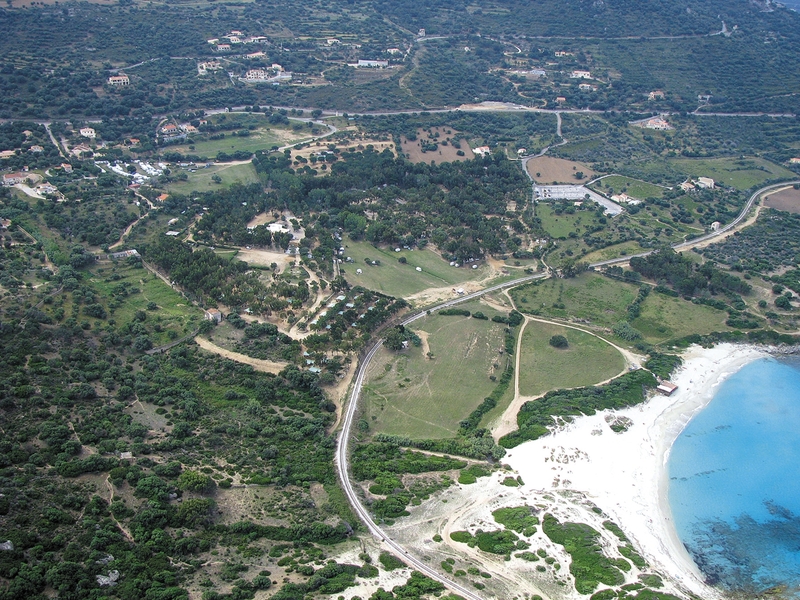 Behind the beach is the Bodri camping area and you would be right to suggest that Corsican nudist beaches are close to a camping area. There might be some dry clumps of sea weed that’s been washed up on the sand but this will be nothing to worry about. Tram: Catch the tram that runs between Calvi and L’lle Rousse. There’s a station behind the beach and walk on the trail to the beach. It is the first station from L’lle Rousse, heading towards Calvi.